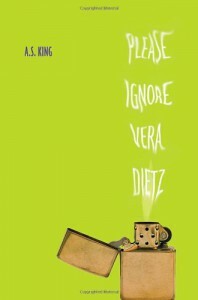 Review: Please Ignore Vera Dietz! Best Part: Vera's view on the world! Worst Part: 23yr old drop outs! Thoughts Had: The apple doesn't fall far from the tree. Short Review: I can relate to Vera so much, when she was thinking about how that poor guy could have killed her and chopped her up, i think like that all the time, so i get it. It was very cool to have "Words from dead guy" in the story as well. It was nice to have Charlie's input after the fact. The whole animal thing was a bit much for me, but i guess it's better than beating up some people. This books does a good job of depicting the pressures of turning out like your parents, and how things can spiral out of control pretty fast. It was very fast pace and i enjoyed reading it. I just didn't like the creepy 23yr old.